Must successfully complete pre-departure experience, TRIPS experience, and post-departure experience. The badge is awarded to students who have successfully completed an alternative break service experience with the TRIPS Program. We hope you had a chance to engage your values, convictions, and religious beliefs, in addressing the shared needs of our communities. May you continue to choose to deeply consider and regularly choose the common good in all that you do. 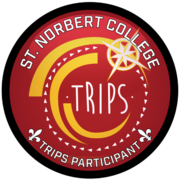 The TRIPS Participant badge is considered a "Moving In" badge in the category of Personal Character and Virtue.